While the suggested accounts might be personalized by Twitter’s understanding of my interests, and in shel’s case it provides a bit of data (someone I follow follows him), on the whole it’s pretty basic. I feel no excitement, no engagement and have largely gone blind to the unit. Twitter is full of smart people so I don’t doubt whatever they have is optimized but perhaps to a local maxima (or at least the effort<>reward of this growth feature). What would be more interesting to me? An interesting exchange between someone I follow and someone I don’t with a recommendation to follow the latter. 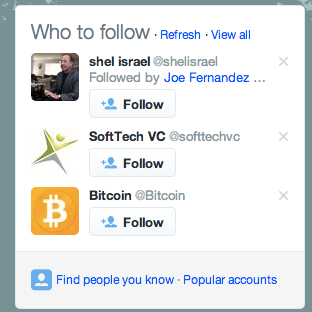 A single account with their last – or most popular – tweet displayed alongside so I’m enticed to follow SoftTechVC or Bitcoin. Some variation in the display that causes me to check it out each time. When we recommended a video someone didn’t like, the user blamed themselves and not us! The first benefit is self-explanatory but the second one was unexpected, amusing and deserves a bit of elaboration. 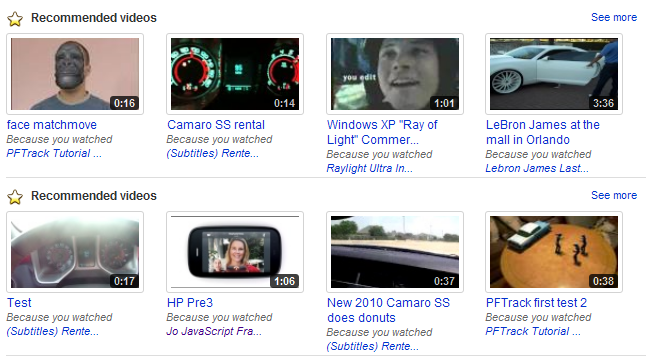 Let’s say you come to your YouTube homepage one day and we’re recommending you watch a Justin Bieber video. “No way” you might say, “I’m NOT a Bieber fan. YouTube’s personalized recommendations suxxxx.” When we showed you that same recommendation but told you we were recommending it because you had watched Miley Cyrus “Party in the USA,” all of a sudden the user was all “um yeah, I guess I did. Heh heh.” Now of course our goal was to provide the right video, something they’d enjoy and click on, but it was interesting to see the change in perception this context provided (an impact we deemed as positive). So I’m generally a fan of experimenting with additional context when it provides a look inside your algorithmic black box. I think it makes your product seem more human to its users and feels like your algorithms are working on behalf of the person and their interests rather than just treating them as a row in a user database. Would be very interested to hear about other people’s experiences that had similar or different outcomes with regards to context.